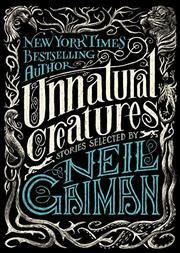 Gaiman gathers 16 stories featuring magical beasts and monsters—dangerous ones, mostly—as a benefit volume for a creative writing program, 826 DC. The Newbery winner contributes his name and selection duties, a short preface, quick introductions to the tales and a previously published short—an homage to R.A. Lafferty featuring a captured phoenix and a jaded group of epicures—to the project. Other entries, all but three of which are reprints, range from Frank R. Stockton’s “The Griffin and the Minor Canon” and other older classics to Peter S. Beagle’s eerily elegant “Come Lady Death,” Avram Davidson’s chilling closet fantasy “Or All the Seas with Oysters,” a Chrestomanci tale from Diana Wynne Jones and artfully discomfiting contributions from younger writers (including the co-editor). Each opens with a small, dark, fine-grained image of a creature or partial figure that sets an appropriately ominous tone for what follows.